In preparation for Jamie’s upcoming trip and year in the U.S., a shopping spree at the local handicraft market was necessary. The variety of beautiful handmade items is a reminder of one of the advantages we have living in Ecuador. At the end of the day, Jamie had selected some truly lovely items. 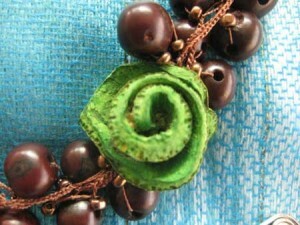 Take a look at the lovely shawls, scarves, hats, coin purses, and tagua, balsa, and straw jewelry. What seems hard to believe is the price…. 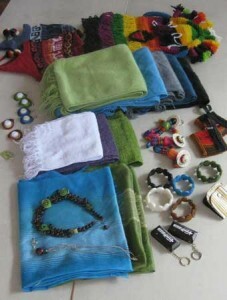 all of this for a little under US $90!!! 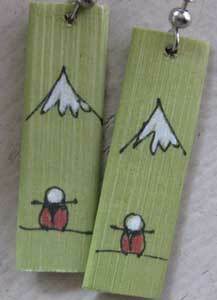 These tiny balsa earrings measure only 1/4″ across! 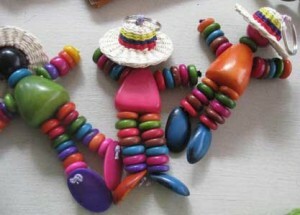 But I am especially impressed with the ingenuity of local crafts people. Look at this necklace made of seeds and – of all things – orange rind! 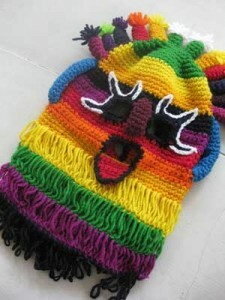 And my absolute favorite of the lot… this knit danzante mask. Isn’t it a riot?